Malaria is an endemic infectious febrile disease, which affects over forty percent of the world’s population in hundreds of countries (World Health Organization). The World Malaria Report 2013 disclosed that approximately 3 million people die of this disease every year, accounting for five percent of all fatalities in the world, while being the leading cause of children’s death. Malaria is one of the oldest diseases known to humankind, even though its evolutionary and ecological events remain undetermined (Malaria Site). Malaria is caused by a single celled protist of the genus Plasmodium, which is part of the phylum Apicomplexa. These organisms possess an apicoplast, which is an organ that is designed to aid entry into a host cell. Plasmodia belong to the order Haemosporida that contain parasites, which swarm red blood cells. Categorized under the family Plasmodiidae, several characteristics are shared, including sexual reproduction in a definitive host, and asexual reproduction in a vertebrate host. In the case of human malaria, the definitive host is often referred to as the vector. Plasmodia are divided into numerous different species, of which five are known to infect human beings: Plasmodium falciparum, P. vivax, P. ovale, P. malariae and P. knowlesi. Although four Plasmodium species are known to cause human malaria, the zoonotic species P. knowlesi that causes the disease in macaques has emerged as a fifth strain, causing sever infections in humans (Kantele & Jokiranta, 2011). Plasmodia are transmitted to human beings through the bite of an infected female mosquito of the genus Anopheles, which remain contaminated for a lifetime. 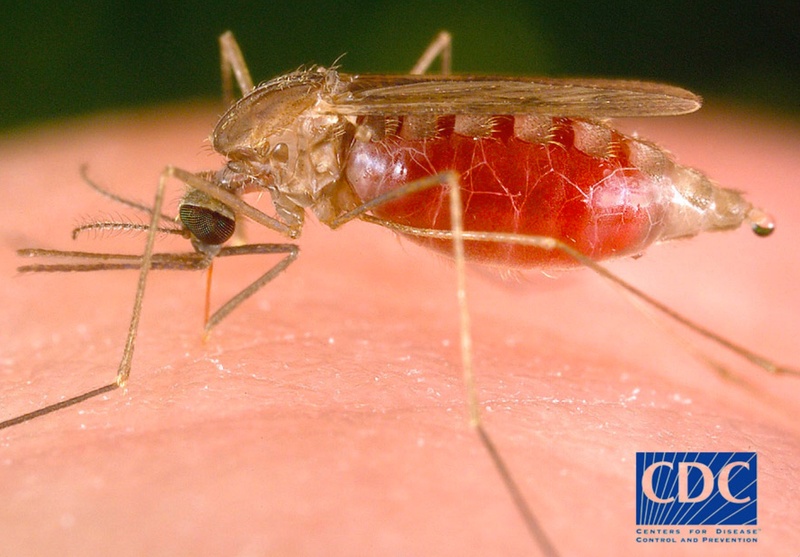 Anopheles gambiae can fly continuously for a considerable long time, when compared to other mosquito species, allowing them to travel a long distance per night (Centers for Disease Control and Prevention). This advantage allows the vector to spread the disease further away in a specific period of time. Malaria can’t be transmitted directly from person to person, but it can be transferred via organ transplantation, blood transfusion, or needle sharing. Pregnant women can transfer the disease to the fetus congenitally, which is known as congenital malaria. Human malaria doesn’t spread to animals, and in turn, animal malaria doesn’t carry over to humans. 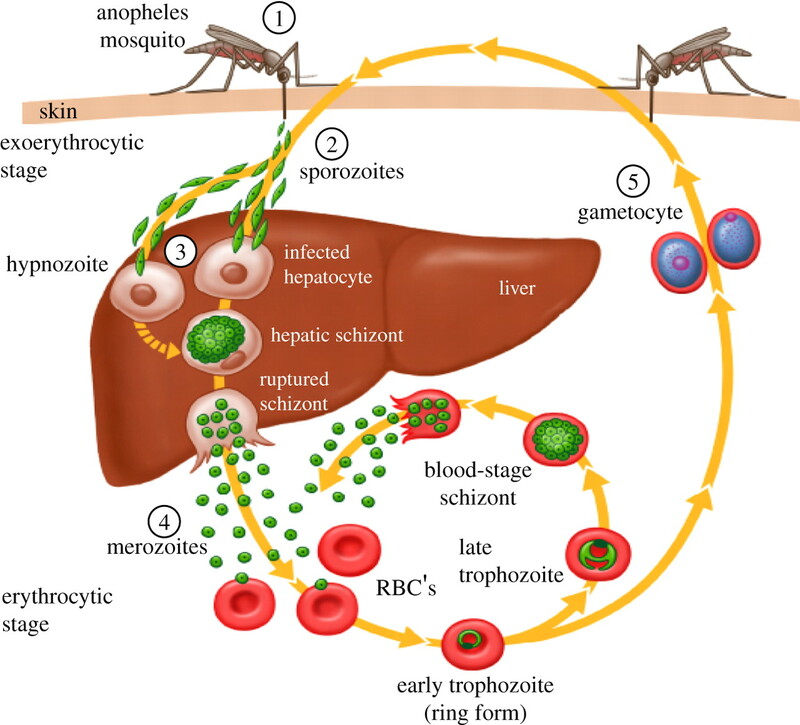 The cycle of life of the Plasmodium parasites is extremely complex, thus defined by its multistage within the vector and the vertebrate hosts (Malaria Site). When the female Anopheles feeds from an infected human being, it takes in immature gametocytes suspended in the host’s blood. 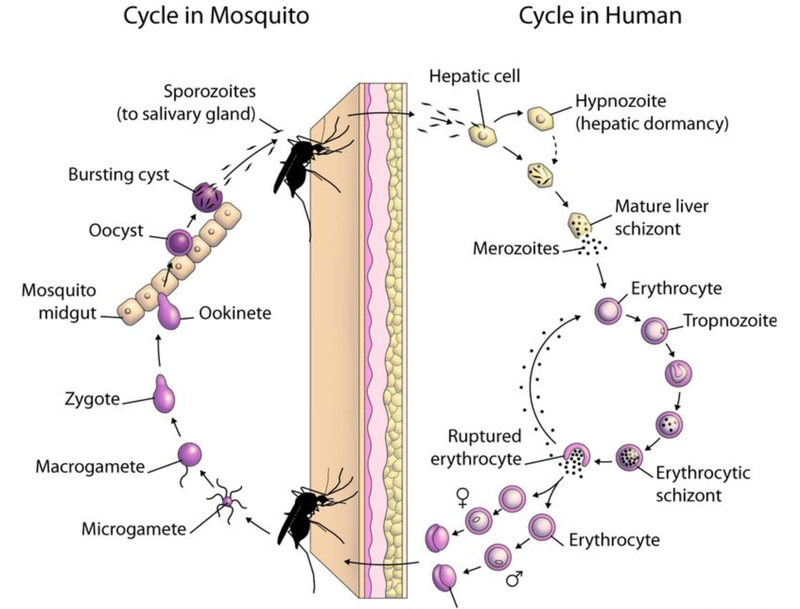 The gametocytes travel to the mosquito’s gut where they mature into gametes. The gametes then form diploid zygotes that burrow into the midgut epithelium where they develop into oocysts. At this stage, the oocysts will incubate for almost two weeks, before bursting and releasing infectious sporozoites into the mosquito’s hemolymph, where they invade the salivary glands. 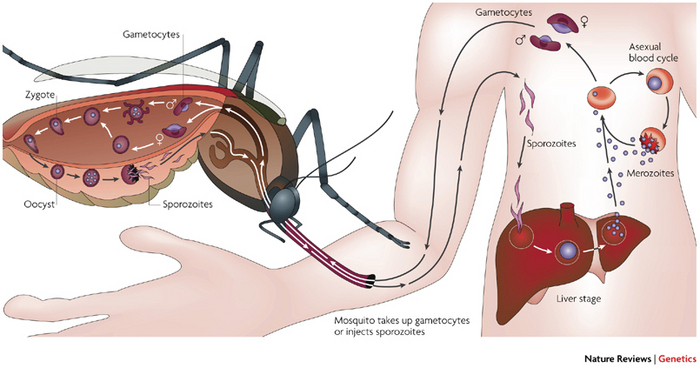 Consequently, the Anopheles will transmit the infective form of the parasite into the human blood stream through a bite with its saliva. The sporozoites will reach the liver in approximately thirty minutes; it begins development in the hepatocytes through asexual reproduction, a process known as tissue schizogony. Each sporozoite multiplies into 20-30,000 haploid merozoites during pre-erythrocytic schizogony. Eventually, the merozoites rupture the liver cells and are liberated into the blood stream. At this stage, only a few hepatocytes will be affected, not leading to any symptoms. The erythrocytic phase takes place now, in which the merozoites infect fresh red blood cells. They divide into 8-32 new merozoites, known as erythrocytic schizogony, and rupture the red cells to infect more. This phase is a cycle that reoccurs every 48 to 72 hours. Some merozoites develop into immature gametocytes outside of the red blood cells, which are the predecessors of male and female gametes to be taken up by a new vector, and repeat the cycle. “The survival and development of the parasite within the host’s intracellular and extracellular environments, is made possible by a toolkit of more than 5,000 genes and their specialized proteins” (Malaria Site). Within the vector, the malaria parasite must undergo 8-35 days of development before the infectious sporozoites are formed (Infectious diseases epidemiology and surveillance). The time between the vector bite, and the first parasite detection in the host, is six to sixteen days. Clinical symptoms occur after a specific period of time, generally between weeks to a month, depending on the type of strain. Some strains of P. vivax may not appear until 8-10 months after the vector bite has occurred (White, 2011). Tissue forms of P. vivax and P. ovale go into a hibernation stage to tide over adverse conditions, and can stay latent in the liver for up to a year. Plasmodium parasites not only infect, but they destruct red blood cells, and suppress their production in the bone marrow. As a result, anemia is the most immediate pathologic consequence of malaria. Other signs of the infectious disease are splenomegaly and black urine. The spleen enlargement is caused by the accumulation of red blood cells, and the proliferation of white blood cells in the blood-filtering organ. The merozoites get their nourishment from the hemoglobin through the degradation of intracellular proteins. Heme, which is the non-protein component of hemoglobin, results in a waste product that produces the pigmentation observed in the urine, known as malarial pigment. Organ dysfunction can be a long-term consequence, as a result of this infectious disease. Hence, malaria can potentially turn into a multisystem disease (Malaria Site), because the involvement of red blood cells affects every single organ, and the human body as a whole. Malarial paroxysm is the classic symptom of this infectious febrile disease, which occurs periodically, depending on the strain. P. vivax generally has a tertian pattern, but it can also be manifested every day, a scheme referred to as quotidian malaria. This type of pattern is common when the host has two progeny segmenting on alternate days. Even though the ague is characterized by reoccurring fever, malaria is also known as “the Great Imitator” or “Trickster”. In endemic areas it presents a countless number of manifestations. 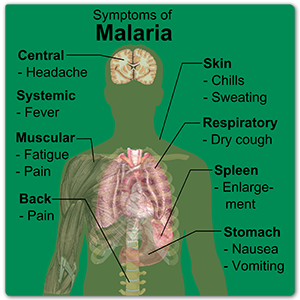 The headache and body ache, which are commonly symptoms of malaria, mimic meningitis, encephalitis or ICSOL. Chest pain, due to spleen enlargement and perisplenitis, coupled with hypertension, mimics acute myocardial infarction. “All the clinical manifestations of malaria are due to the erythrocytic phase that results in the release of pro-inflammatory products of red cell membrane and of the parasites” (Malaria Site). The ague is characterized by three stages: the cold, hot and sweat stage. The injured tissue cells release chemicals like leukocytic pyrogens, and prostaglandins that act on the hypothalamic neurons, which are the thermostatic center of the brain. As a result, the temperature set point is increased, and the heat mechanisms of the body are activated. Vasoconstriction takes place; the host experiences chills and starts to shiver uncontrollably for a couple of hours, until the new temperature set point is met. The greater the injury, the higher the set point is raised. The hot stage can last up to six hours, maintaining an abnormally high body temperature, before the healing tissue cells stop chemo taxis. Once the set point is brought down to normal, histamine is produced to dilate blood vessels, and the body experiences profuse sweating for several hours to cool off. Malaria can be diagnosed by the examination of blood under a microscope. The traditional smear exam is done using the Romanowsky stain technique, which is an eosin-methylene blue stain, to make the parasites visible. Acridine orange (AO) is a fast staining agent that can be used over the traditional Giemsa stain, to make malaria parasites visible under the microscope too. Other methods of diagnosis exist, like the enzyme-linked immunosorbent assays (ELISAs) and polymerase chain reactions (PCRs), but they are substantially slower and therefore not practical (Tangpukdee, et al., 2009). Malaria is treated by the administration of blood schizonticidal drugs, for the alleviation of symptoms. Tissue schizonticidal and gametocytocidal drugs are given to prevent relapse and transmission respectively. These tissue schizontizides prevent the development and release of merozoites in the liver into the bloodstream, whereas the gametocides kill gametocytes that could potentially be picked up by a mosquito, to continue the cycle of life and survival of the species. The type of drugs, the method of administration, and the duration of the treatment are dependent on where the disease has been contracted, and how sick the patient is. The World Health Organization explains the medications used, and the mechanisms of action of each drug in detail in the book “Guidelines for the treatment of malaria” published in 2010. All strains, except for complicated P. falciparum, are treated with Chloroquine, which is a 4-aminoquinoline compound. It has a complex and still unclear methods of action, but it is believed that it reaches high concentrations in the parasite’s vacuoles, raising their internal pH due to its alkaline nature. Chloroquine controls the conversion of toxic heme to hemozoin – the waste product formed through the digestion of blood by the parasites – by inhibiting the bio-crystallization of hemozoin. This way, the parasite is poisoned through the excess levels of toxicity. This drug has a significant anti-pyretic and anti-inflammatory effect on P. vivax strains (Khanna, 2007). Those strains that are resistant to Chloroquine are treated with a combo of Quinine and Tetracycline. Quinine is an alkaloid that acts as a blood schizonticidal, and weak gametocide against P. vivax and P. malariae (World Health Organization). This chemical accumulates in the parasite’s vacuole, especially in P. falciparum strains, and inhibits the hemozoin bio-crystallization. Thus it facilitates the aggregation of cytotoxic heme. Tetracycline is a compound derived from oxytetracycline, which belongs to the earliest groups of antibiotics to be developed. Its bacteriostatic agent acts to inhibit the process of protein synthesis by binding to the 30S ribosomal subunit, thus preventing 50s and 30s units from bonding. Quinine resistant strains can be treated additionally with clindamycin, mefloquine, sulfadoxine or pyrimethamine (Barat & Bloland, 1997). Primaquine is mainly used to prevent relapses after the recovery of P. vivax and P. ovale (Hill, et al., 2006). The journal “Primaquine: report from CDC expert meeting on malaria chemoprophylaxis I” states that this highly active 8-aminoquinoline can treat all types of malarial infection, although it is most effective against gametocytes. It can also act on blood schizonticytes and dormant Plasmodia in P. vivax and P. ovale. Primaquine is the only known drug to cure both relapsing and acute cases (Builders, 2013). It is thought that it blocks the oxidative metabolism in Plasmodia, but its mechanisms of action are not fully understood yet. A cure or a plausible vaccine for malaria doesn’t exist so far. Unfortunately, there is little data available on the human immune response to all stages of Plasmodium, due to the poor understanding of the disease’s outcome. Plasmodium has several life stages, making it very challenging to select important antigens for targeting in on a vaccine. The parasitic protozoa evade the immune system detection of the human body, and possess different cytokine profiles for various strains (Sadanand, 2010). Researchers do not know which antigens are activating the innate immune system, and consequentially what innate immune receptors are most relevant. The complexity of conducting clinical and field trials, the difficulty of evaluation, the mutation of the parasites, the multiple antigens that are specific to each species and stag, and their ingenious ways of avoiding the host’s immune response – all these, and more, are the difficulties that researchers are confronted with, while searching for the perfect vaccine cocktail. 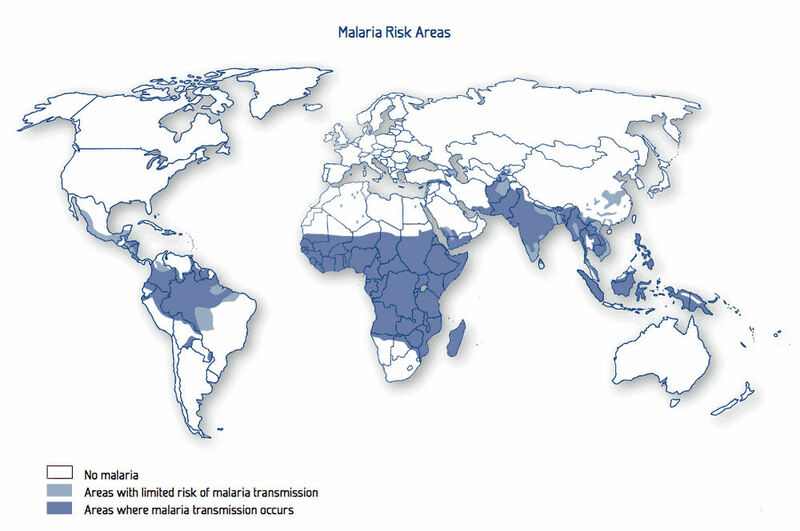 Additionally, malaria is endemic in regions fighting tuberculosis and HIV infections. The most vulnerable population, which refers to children, pregnant women, and immune-compromised patients, may be unable to receive a vaccine to develop protective immunity in the first place. All of these are some of the myriad factors that make it extremely challenging to come up with a vaccine, or cure for malaria. A world without mosquitoes might be the only way. Barat, L. M., & Bloland, P. B. (1997). Drug Resistance Among Malaria And Other Parasites. Infectious Disease Clinics of North America, 11(4), 969-987. Builders, M. I. (2013). Antimalarial Drugs: a Review. International Journal of Pharmacy, 3(1), 40-46. Croft, S. (2001). Antimalarial Chemotherapy: Mechanisms of Action, Resistance and New Directions in Drug Discovery. Drug Discovery Today, 6(22), 1151. Guidelines for the treatment of malaria (2nd ed.). (2010). Geneva: World Health Organization. Kantele, A., & Jokiranta, T. S. (2011). Review of Cases With the Emerging Fifth Human Malaria Parasite, Plasmodium knowlesi. Clinical Infectious Diseases, 52(11), 1356-1362. Tangpukdee, N., Duangdee, C., Wilairatana, P., & Krudsood, S. (2009). Malaria Diagnosis: A Brief Review. The Korean Journal of Parasitology, 47(2), 93. White, N. J. (2011). Determinants of relapse periodicity in Plasmodium vivax malaria. Malaria Journal, 10(1), 297.